While the rest of the country is instagramming their pumpkin spice fetishes and clamoring about exhausting political news (#helpus), I thought I’d do something a little different. 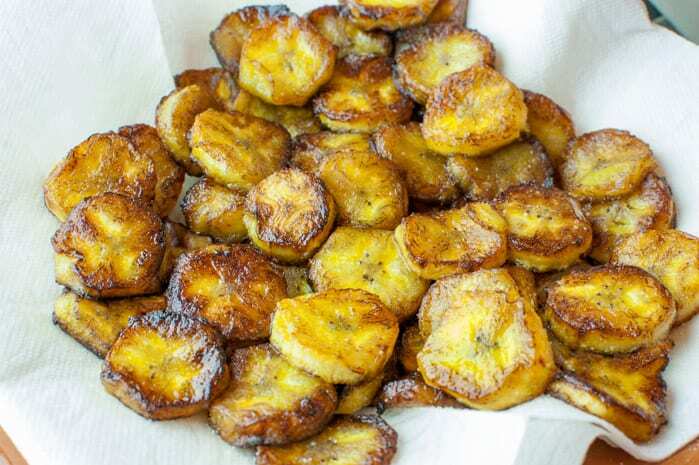 These fried plantains are good enough to eat on their own, but they go well with a variety of dishes. Have you ever had them? Just nod if you can’t answer because you’ve got a straw currently importing a pumpkin spice frappuccino directly into your face. Plantains are a member of the banana family. 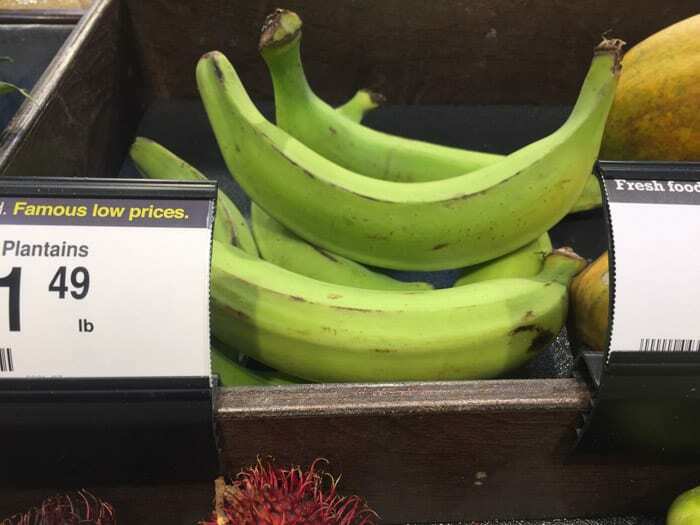 Unlike bananas, plantains are bitter if eaten raw. They are best fried or baked and, although they have sweet flavor, they’re used mostly in savory dishes in the same way potatoes are used. I first tried plantains when I ate dinner at this out-of-this-world Cuban restaurant in Los Angeles called Versailles. They were fried and served on the side with roasted garlic chicken and rice. The sweet and savory combination of the plantains with the salty chicken had me hooked! Now you can make your own fried plantains and serve them with chicken, rice, black beans, roasted pork, burgers…get creative! They go well with my Costa Rican Inspired Breakfast! How do I know when my plantains are ripe? 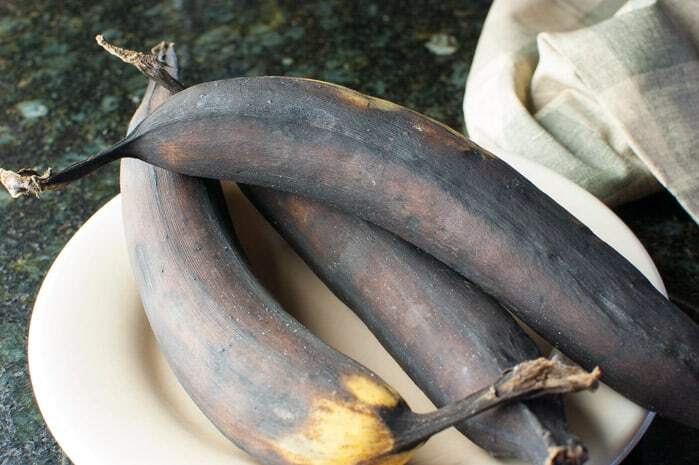 Plantains can be cooked when they’re green or yellow but, for frying, they’re best when they’re mostly black with a little bit of yellow still left. I once tried frying plantains when they were still mostly yellow with a few black spots, and they were a little on the dry side and not as flavorful. As a plantain ripens and turn more black, it’s high starch content turns to sugar, making it perfect for fried plantains. It does take a little bit of patience because most grocery stores sell them when they’re not quite ripe. So ya gotta plan ahead! 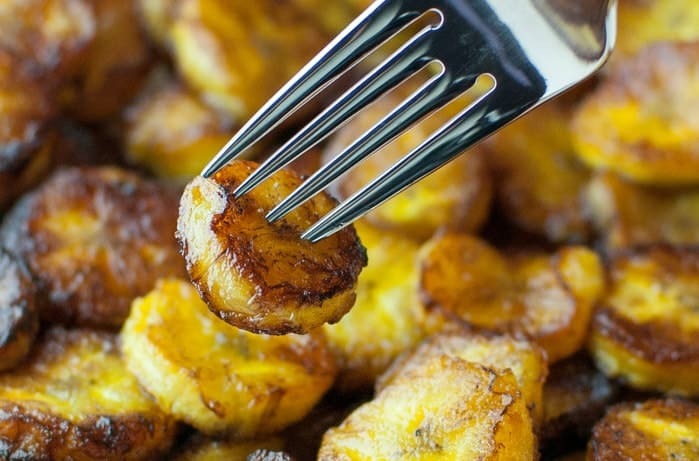 Making the perfect fried plantains requires a little bit of planning by purchasing them in advance and letting them ripen on the counter for several days or even up to a week, depending on what they look like when you purchase them. How do I cut a plantain? For starters, you don’t peel them like a banana. I tried that. Fail. Cut the ends off along the green dotted lines. 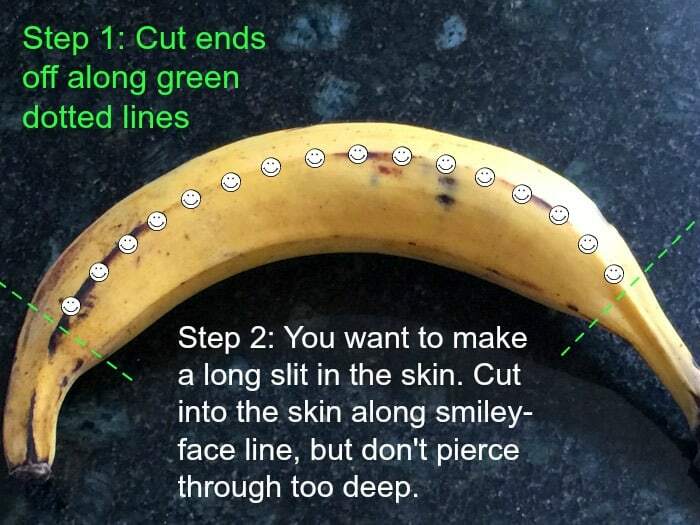 Make a slit in the skin down the length of the plantain. Follow the smiley faces – ain’t this fun? Don’t pierce too deep because you don’t want to cut into the plantain. Peel off the skin. 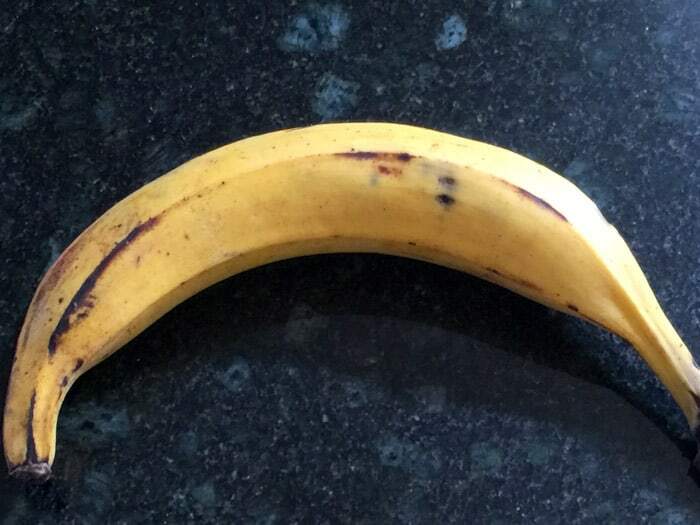 It may be a little hard to peel if the plantain is too ripe. If that’s the case, you may have to work a little harder but that doesn’t mean there’s anything wrong with the plantain. Now you’re ready to cook ’em! It’s super easy. You’re gonna get out your nonstick skillet. You’ll heat up some vegetable oil in the pan over medium heat. And you cook them in batches, flipping them over once they’re golden brown. As soon as they’re done you let them drain on some paper towels or on a plate and hit them with a dash of salt while saying BAM! like Emeril Lagasse. Don’t worry, no one’s watching. They get all ooey gooey [<– sorry] caramely-ish [<– official chef jargon] and you’re going to feel like you’ve accomplished some major life goals after making these. While they’re still warm, devour. I expect a lot of oooohs and aaaaahs coming from your direction, okay? Just nod if you’re too busy shoving fried plantains into your face. Pour a few turns of vegetable oil in a nonstick skillet over medium heat. 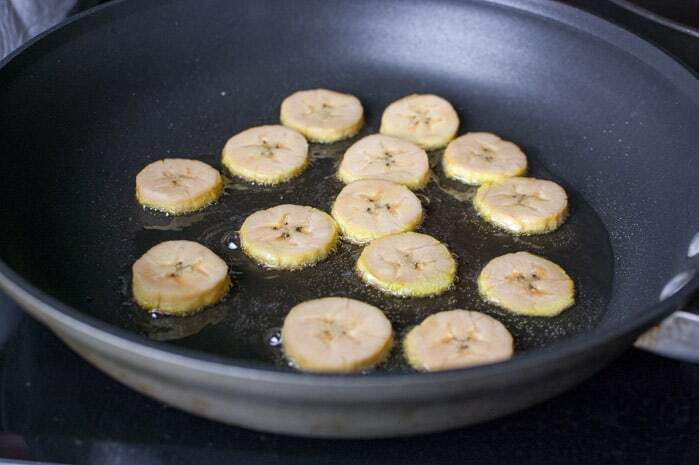 Make sure your pan and oil are heated well before adding the sliced plantains. 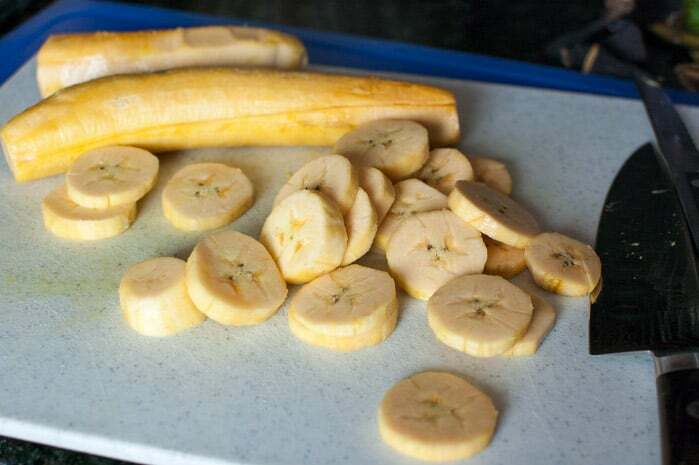 Add as many plantain slices to the pan that will fit, without having them touch each other. Once they appear to be golden brown, flip over and fry the other side until they’re golden brown (usually about 2 minutes on each side, depending on how hot your pan is). If you find they’re cooking too fast and turning black, turn your heat down. Transfer to plate or lay on paper towels to cool. Sprinkle with ground sea salt while they’re hot (okay to substitute regular table salt). If you have any leftovers, refrigerate. These can be reheated in the microwave. 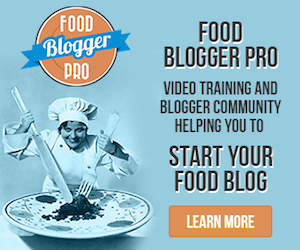 Looking for more information about plantains? Check out this post by Mucho Gusto! Lots of great information. I have never had a Plantain, but those look like I should definitely try that sometime! You make everything look SO “eatable”. Thanks for another great post! Thanks! Yeah they are really good. 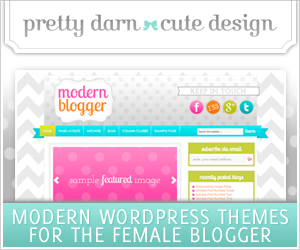 Thank you for your post & Happy New Year! Thank you so much for your feedback! I’ll try again with your tips! Have a nice day!!! I tried frying plantains a week ago and waited until it had more black with yellow skin. Cut them and started frying. But after they looked to be about golden brown, they were very soft, almost falling apart. Is it something I did wrong? I looked at different recipes online first and seemed very basic but I totally failed. I would love to try again if you have any suggestions. Should I have left them longer or maybe use a plantain that is less ripe? Hi Nancy! What result are you trying to achieve? The ones I make (recipe above) are soft and barely crispy on the outside – and I mean barely! They are not like chips. 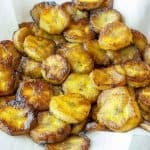 Look at the first picture in this post of the plantains after they’ve been fried – the dark parts are more of a caramelized crisp, not a crunch. Does that make sense? They kind of melt in your mouth. It sounds to me like maybe yours turned out ok, unless you wanted them crispy, which would be a little bit of a different procedure to get those results.